- Price for children is the same as adult price. - Tulamben Beginner Dive is a program for beginners who do not have a license/certificate. - Tulamben Fun Dive is a program for those who have license/certificate. - The voucher is valid only on the date specified. - Free transport in Nusa Dua, Kuta, Legian, and Seminyak areas. - Additional transport charge $10 in Uluwatu, Kerobokan, Ubud, Jimbaran, and other areas. - Please kindly wait at hotel lobby 5 minutes before the pick up time. And, present your confirmation voucher to your driver before departure. Are you expecting the extraordinary moment of diving? The Wreck Dive will go beyond your expectation then! 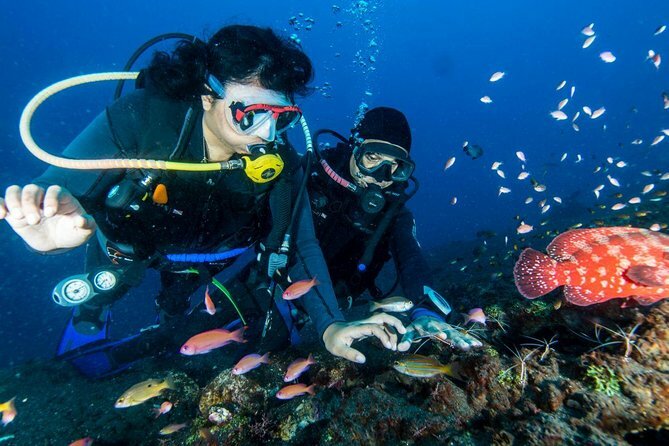 Designed for both beginner and expert, this activity will introduce you to many wonderful diving spots. So, even you’re a beginner, your first time diving will something remarkable to remember. The first spot is Coral Garden. This is the spot where you can find the hiding clown fish in the anemone. Next, you will be taken to Boga Wreck, a place to see the various kinds of statues and cars that formed into artificial reed. Taking some stunning photos is strongly recommended. Then, you will also be brought to Tulamben Wall. This wall was formed by lava river in 1963. After that, you can reveal something bizarre from Seraya Secret. Make sure you spot Purple Leaf Scorpionfish in this site. • Please note that sudden schedule changes may occur due to Balinese religious events that can block the roads etc. • If you use AirBnB accommodation, please write down the nearest hotel address from your Host location. In order to simplify the pick-up service, we will pick you up at the nearest hotel lobby from your Host location.